Lopreto previously served five years in a California state prison for art fraud, also in connection with forged Hirst works. After his release, Lopreto was again arrested in October 2013. An in January 2014, Lopreto and Ronald Bell, his partner in a California art gallery, pleaded guilty in New York to identity theft and scheme to defraud, having sold $1.5 million worth of forgeries. Shortly after his release from New York prison in 2015, Lopreto was back to his counterfeiting ways, according to the Manhattan district attorney’s office. This time around, Lopreto was arrested on June 14, 2017, in connection with yet another scheme to sell forged Damien Hirst prints. Lopreto and two other dealers were indicted this week for stealing $400,000 from dozens of victims of their art-fraud scheme, conducted between October 2015 and February 2017. 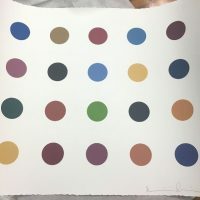 The forged prints imitating Hirst’s famous minimalist polka-dot and spin paintings were sold to Manhattan and international buyers for $3,000 to $5,000 each, with fakes of Hirst’s “Mickey” paintings selling for around $14,000. Investigators found four counterfeit works and tools including a stamp and a printer sufficient for use in art reproduction in Lopreto’s home in New Orleans. And the defendants had advertised the fraudulent prints online as authentic, limited-edition prints, and used fake certificates of authenticity and purchase receipts to dupe buyers into believing the works were originals.